As I sit in the Second Chance Shelter waiting for my new family to come and find me, I see far too many homeless animals also waiting for their second chance. 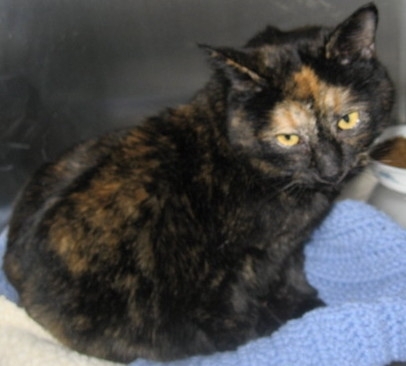 My name is Bell and I am a loving Tortoise Shell beauty with an even more beautiful personality. From my viewpoint it is clear there are more pets in this region than there are homes. Thus the focus of this week’s column: “Spay Day USA”. This internationally recognized day, which, since 1995 has been marked on the last Tuesday of February, (thus February 26th this year) is America’s first and only national day of action to promote the spaying or neutering of pets. (As a side note, the success of this day has spread to other countries as well, such as Argentina, Australia, Canada, Korea, Mexico & Ireland.) During Spay Day, now marked by spay/neuter events and education also throughout the month, veterinary clinics, humane organizations, businesses, and concerned citizens all across the country join forces toward a common purpose. <!–[if !supportLists]–>· <!–[endif]–>To raise public awareness of the pet overpopulation problem. <!–[if !supportLists]–>· <!–[endif]–>To promote spay/neuter surgery as a primary means of addressing companion animal overpopulation. <!–[if !supportLists]–>· <!–[endif]–>To inspire each humane citizen to take personal responsibility for preventing the births of surplus litters by sponsoring the spay/neuter of at least one companion animal or feral cat. 2. If needed, get financial help so that your pets can be spayed/neutered. The Second Chance Spay/Neuter Program is designed for this purpose. As a pet-owning resident of San Miguel or Ouray County, if finances are preventing you from getting your pet altered, you can contact Second Chance for a spay/neuter voucher to help cover a large portion of the expense for this surgery. 3. Sponsor the spay/neuter of other pets through donations to the Second Chance Spay/Neuter Program. 4. Become an advocate for spay/neuter through developing a full understanding of the numerous physical and behavioral benefits to a spayed/neutered pet as discussed regularly in this column and posted on the Second Chance website – address below. You can also volunteer in the Second Chance Community Outreach Program and become an educator/presenter of the spay/neuter philosophy.